Unrequited love is a universal theme. Match it with compelling music and a legend familiar to most Kyrgyz and you get 'Alymkan', one of the most popular vocal showpieces in the traditional Kyrgyz repertoire. 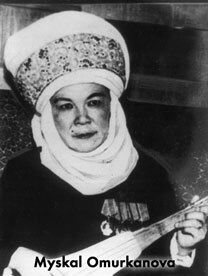 The legend concerns Toktogul Satilganov, whose story and significance is detailed in the 'Noted Composers' section of this website. 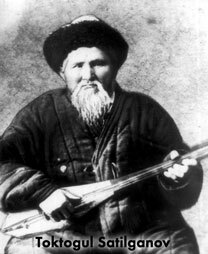 Satilganov's songs, reputedly critical of the wealthy beys who led Kyrgyz society in the late 19th century, prompted his exile to Siberia. There, he longed for the village beauty Alymkan, who was married off to a bey in his absence. Satilganov left only the lyrics of 'Alymkan'. 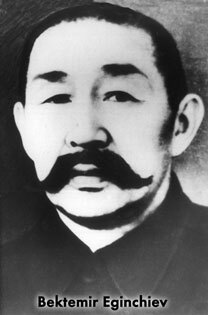 The music was composed by Bektemir Eginchiev(1910-1964), described by Kyrgyz ethnomusicologist Balbai Alagushov as "composer of Kyrgyz folk lyrical and patriotic songs." His compositions often challenge singers to showcase the Kyrgyz penchant for holding notes longer than seems humanly possible. 'Alymkan' was first recorded in the 1950s by the great female singer Myskal Omurkanova (1915-1976). Ms. Sadikova preserves several songs popularized by Omurkanova in her repertoire. 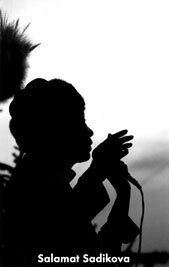 In the 1990s, a techno-pop arrangement of 'Alymkan' by young Kyrgyz singer Jildiz Osmonalieva won a prize in Almaty Kazakhstan's 'Voice of Asia' festival. The audience response to this performance by Salamat Sadikova indicates that 'Alymkan' remains a Kyrgyz favorite. A dynamic performance of 'Alymkan' by Baktybek Shatenov appears on the CD "Shuudungut's Road: Music of the Kyrgyz People of Central Asia". An English translation of the lyrics appears in the CD booklet. Ms. Sadikova notes that Kazakh President Nursultan Nazarbayev deems this his favorite among the songs she performs. Her popularity in Kazakhstan is attested to by her having been awarded the title 'Honored Artist of the Republic of Kazakhstan'.